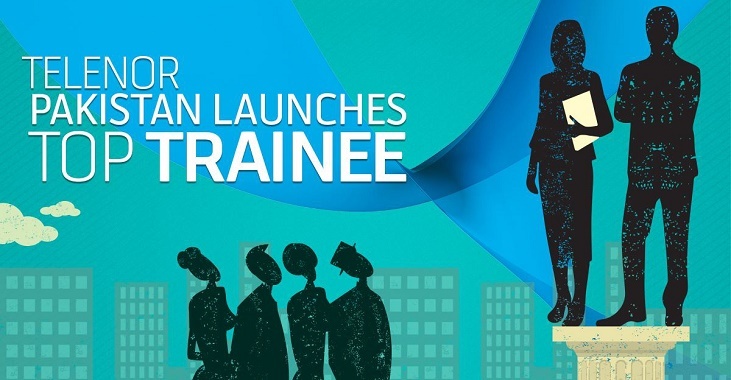 Telenor Pakistan has officially launched the Telenor Top Trainee Program 2015 to train fresh graduates in Pakistan. Graduates having an experience of less than 2 years (i.e. from 0 to 2 years) in their relevant fields can apply for it; the last date to apply for the trainee program is June 14, 2015. The Telenor Top Trainee 2015 will be a 1-year-long professional development program where selected candidates will be trained rigorously in their professional fields. Throughout the 12 months of training, officers will receive all monetary and non-monetary benefits enjoyed by regular Telenor employees. Selected applicants will be placed in the Islamabad offices of Telenor Pakistan at the career level equivalent to that of an Officer. Graduates of the Trainee Program will be offered full-time employment in their department of placement at the end of the program (based on the decision of management and evaluation of goals achieved during the training period). Apart from gaining exposure to Pakistan’s telecom industry and thorough training through attachment in multiple areas, officers will also receive coaching and mentoring from senior leaders in organization. Aspiring candidates who fulfill the above-mentioned requirements can apply for the Telenor Top Trainee Program 2015 via Telenor’s official Career portal. Click here to visit the online Career portal, select your relevant area of interest from open vacancies, and apply for it after logging in or creating your new account. If you need more guidance on how to create new account and build your profile, you can visit our previous post regarding Telenor’s Summer Internship Program.